factors in turn determine antenna size and transmitter power—the major cost drivers in sizing the space system. The fourth step, described in Sec. 13.4, provides information to aid the reader in estimating the size and mass of the satellite antennas, and primary power and mass of the satellite transmitters. 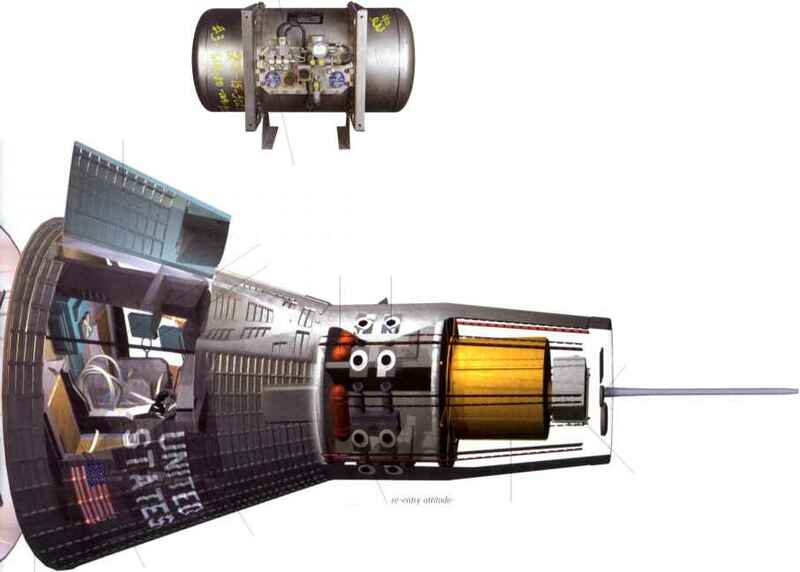 These parameters are inputs to the spacecraft design process described in Chap. 10, and the ground system design process described in Chap. 15. A communications architecture is a network of satellites and ground stations interconnected by communication links. The term ground station is equivalent to Earth station, ground terminal, and Earth terminal, including land mobile, airborne, and shipborne terminals. All of these names refer to the same thing: the antenna, transmitter, receiver, and control equipment required to communicate with the satellite. Communication links allow a satellite system to function by carrying tracking, telemetry, and command data or mission data between its elements. Figure 13-1 illustrates the ground station-to-satellite uplinks, satellite-to-ground station downlinks, and satellite-to-satellite crosslinks, or intersatellite links, that support a space system. Not shown are additional communication links which may te necessary to transfer data between the ground stations and a mission control center or users. For example, the Air Force's Satellite Control Network uses the DSCS-m communications satellite to relay data between remote tracking stations and the satellite control facility in California. In space systems, the transmitter and receiver must be in view of each other, using frequencies high enough (above 100 MHz) to easily penetrate the Earth's ionosphere. A satellite in a nongeostationaiy orbit is often out of view of its user's ground station. In this case a second satellite, usually in a geostationary orbit, may be used to relay data between the satellite and its ground station. The ground station-to-satellite link is the forward link, and the satellite-to-ground station link is the return link. As shown in the figure, both the forward and return links contain uplinks, downlinks, and crosslinks. Fig. 13-1. The Communications Architecture Consists of Satellites and Ground Stations Interconnected with Communications IJnks. Since 1990, several new classes of satellites in the orbital category of low-Earth orbit (LEO) and medium-Earth orbit (MEO) have been developed for various commercial uses. They will be used for both satellite-based cellular telephone service as well as for wideband data trunking (fiber optic type service where there is no fiber) and data distribution for Internet-type services. In these new systems, the terms forward link and return link sometimes take on new definitions. As in terrestrial cellular, the forward link for a satellite-based cellular system is from the ground station (gateway) to the user terminal (UT) or radiotelephone, and the return link is from the radiotelephone to the ground station. In this terminology, both the forward and return links contain uplinks and downlinks to and from the satellite. A constellation at an altitude of 1,000-1,500 km typically requires from 48 to 64 satellites to provide complete Earth coverage. A constellation at 10,000 km typically requires 12 satellites. 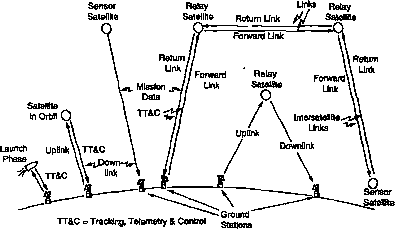 The geometry formed by satellite orbits and ground stations determines the basic communications architectures illustrated in Fig. 13-2. Table 13-2 lists the principal advantages and disadvantages of each. Fig. 13-2. Typical Communications Architectures Used to Satisfy Different Mission Requirements. Table 13-2 summarizes the characteristics of each architecture. TABLE 13-2. Comparison of Five Example Communications Architecture. due to the wider antenna beamwidth required to illuminate the Earth, which reduces the satellite antenna size and stabilization requirement. Usually satellite stationkeep-ing is not required. The principal disadvantage of this architecture is its long access time and transmission delay, perhaps hours, waiting for the satellite to pass into view of the user ground station. There are several commercial systems planning to use store-and-forward communication for very low-cost service. They include ORBCOMM, Starsys, Vita, LEO-1, FA1, and ESat They typically operate in the VHF portion of the radio spectrum at very low bandwidths. These are sometimes referred to as "little LEOs." Geostationary Orbit (Fig. 13-2B): Virtually all communication relay satellite systems and many meteorological satellites use this architecture, in which the satellite is placed in a near-zero deg inclination orbit at 35,786 km altitude. The period of the orbit is exactly equal to the period of the Earth's rotation, making the satellite appear stationary when viewed from the ground (see Sec. 6.1). The cost of ground stations is usually less for this architecture because little or no antenna pointing control is required. A stationary network is far easier to set up, monitor, and control compared to a dynamic network containing n on stationary (relative to Earth) satellites. There is no need to switch from one satellite to another, for the satellite is always in view of the ground station. Principal disadvantages are lack of coverage above 70-deg latitude and the high laiunch cost Furthermore, the delay time for propagation to and from the synchronous orbit is about 0.2S sec, which sometimes causes problems (echoes, acknowledgment protocols) in communications satellite systems. Molniya Orbit (Fig. 13-2Q: The Russian space program uses this architecture to cover the northern polar regions. The satellites are in highly elliptical orbits with an apogee of 40,000 km, a perigee of 500 km, and an inclination angle of 63.4 deg (see Sec. 6.1). The apogee is over the North Pole to cover northern latitudes. The period of the orbit is 12 hr, but because it is highly elliptical, the satellite spends about 8 hr of each period over the northern hemisphere. Two or more satellites orbit in different planes, phased so that at least one is always in view from all northern latitudes. Unfortunately, the Molniya orbit requires continuous changing of antenna pointing angles at the ground station and switching links between satellites as they move in and out of view. Geostationary Orbit with Crosslink (Fig. 13-2D): When a geostationary satellite is beyond line-of-sight of a ground station, a second geostationary satellite relays data between it and the station. A relay satellite is better than a double-hop link using two adjacent ground stations as a relay (shown in Fig. 13-2B), because die relay ground stations must often be on foreign territory, which is more costly, less secure, and less survivable. The obvious disadvantage of this architecture is the added relay satellite and its crosslink, which increase the system's complexity, risk, and cost. Low Altitude (Fig. 13-2E): This architecture places 20 or more satellites in low-altitude (500 to 3,000 km) orbits and sometimes connects them with crosslinks. The system divides digital messages into packets of a few hundred or thousand bits, labels each packet with time-of-day and its destination, and then transmits it in a short burst. Packets may arrive by different paths with different propagation times, depending on the satellite-ground station geometry at the time of transmission. The receiving station must sort and reassemble the packets in the correct order to obtain the original message. Because so many alternate paths are available, the system is highly survivable. The low-altitude orbit also improves immunity to jamming from the ground since the satellite sees a smaller Earth area. Finally, the uplink transmitter power is lower due to the shorter distance between ground station and satellite, making unauthorized reception less probable. On the other hand, this architecture needs complex network synchronizing and control functions because of relative motion between satellites and ground stations. Without stationkeeping, the satellites may drift together in bunches, leaving gaps in the coverage which lead to significant link outages. Note: The satellite-based cellular telephone service mentioned in paragraph 13.1 and Table 13-2 and below do not use packet transmission as described above, but typically CDMA or TDMA waveforms. • Low-Earth Orbit (LEO) Cellular Satellites. These are the systems such as Iridium, Globalstar, and Ellipso which provide cellular telephone-type service to hand-held and mobile phones from die low-Earth orbits. • little Low-Earth Orbit (little LEO) Satellites. These satellites, including Starsys, Vita, LEO-1, FAI, and ESat, are commercial, low-powered, low-orbit satellites intended for store-and-forward communication at a very low price at VHF frequencies. • Medium-Orbit (MEO) Satellites. These include ICO, Star Lynx, Pentriad, Ellipsat, and TRW Global EHF Satellite Network. They provide cellular as well as high-speed data transfer service. • Low-Earth Orbit (LEO) Data Satellites (also called "Big LEOs"). These include Teledesic, Boeing's Aeronautical Radio Navigation, Globalstar GS-40, and Iridium Macrocell. These satellites will provide digital data trunking as well as Internet access to many users. Other architectures may meet particular mission requirements. For example, Chapell  suggests a hybrid system which contains satellites at both low and high altitudes, thus combining their advantages. Lee  compares three architectures for providing regional communications satellite service to the continental United States. These architectures contain four geostationary satellites, which are either isolated, interconnected by double-hop ground stations, or interconnected by crosslinks. Some systems combine geostationary and low-Earth orbit satellites. Alcatel's Sky-bridge combined with Loral's Cyberstar and Globalstar's GS-2 systems both combine low-Earth orbit satellites for primary customer connection and geostationary satellites to act as relays between LEOs, as well as connecting to some customers. The service is typically data services such as Internet connectivity. Intersatellite links are widely used both between low-Earth orbit satellites and between low-Earth orbit and geostationary satellites in order to perform the required communication functions. Three types of communications architectures, shown in Fig. 13-3, are tracking, telemetry, and command; data collection; and data relay. A point-to-point network is used to provide a link to a single ground station. The broadcast architecture transmits data to multiple ground stations located in different areas. This architecture requires either a broad-beam satellite antenna, a narrow-beam antenna rapidly switching between ground stations, or a multibeam antenna (see Sec. 13.4). In communications-satellite applications, the satellite network control is often part of a larger telecommunications network containing thousands or millions of users. Thus the satellites may be shared among many nonsimultaneous users, using multiple-access techniques described in Sec. 13.5 (see Chap. 2 of Morgan and Gordon ). The satellite communications architecture may be affected by data processing on board the satellite. Usually data collected by a satellite is transmitted directly to the user via the downlink. However, the data often requires processing to make it useful. If the system contains many ground stations, processing the data in the satellite and then transmitting it may be more economical than having each user process it separately. This processing often reduces the data rate, leading to further cost savings (see Sec. 13.2). A satellite system using onboard processing is Europe's Meteosat, which stores and formats cloud-scanner data before transmitting it to several ground stations at a reduced data rate.